Usually doomed, fictional airlines used in movies and TV shows are a great playground for drama stories. From zombies, snakes, mysterious islands, terrorists,... danger is great and we love to see our heroes at 30 000 feets. Just for our frequent travelers, Fly-Belts has gathered the most notorious of them. These made-up airlines take us into the action of various fictions, each of them having an important matter in the story. Trans American Airlines flight 209 to Chicago is not really an ordinary flight. Food poisoning decimates half the passengers. The aircraft is soon unmanned. On board: two terrorists, a Japanese general who thinks he's a suicide bomber and a host of characters completely crazy. Passenger 57 is typical 90's action movie. The Atlantic International Airlines flight number 163 to LAX is hijacked by a dangerous terrorist during his transfer by the FBI. But, unluckily for him, the airline security expert played by Wesley Snipes, prevents him from seizing control of the situation. Helped by a charming air hostess, our heroes manages to safely land the plane in an airfield in Louisiana. The film's success made Snipes a popular action hero icon. It also introduced Snipes' famous line: "Always bet on black." For the small group of students, the trip to Paris promised well. But shortly before boarding their plane, Alex, an american teenager, has suddenly a dazzling vision: the device will explode in flight. Because he will attempt to alert passengers, he will be expelled from the plane with five of his friends and his teacher. They will remain the only survivors when, a few minutes later, the aircraft blows up. South Pacific Airlines used to be an actual airline, which fade in the mid-60's. The 2005 action thriller with Samuel L. Jackson restored South Pacific takes action in a Boeing 747 full of deadly snakes. A criminal escorted by an FBI agent develops a release of poisonous snakes on board the aircraft. They are everywhere, silent and deadly. Between panicked crew and helpless passengers the special agent will have to fight for getting the aircraft to land safely. To hide the escape of a leader of the drug cartel, a highly organized group of terrorists took control of the airport in Washington Dulles International on Christmas Eve. Unable to land, aircraft stationed in the air, gradually losing their reserves of kerosene, passengers no longer have only fifty-eight minutes to live .... Unfortunately for terrorists, wife John McClane (Bruce Willis) is aboard one of the devices, Windsor Airlines flight 114. Get lost in the wild, Desiny calls. Fly Ajira Airways. On a UN mission to save the world from a zombie outbreak, Gerry Lane (Brad Pitt) escapes at the very last moment from a certain death by boarding on an airplane at Tel Aviv Airport. The Belarus flight to Wales manages to take off from the Middle-East with a tiny detail in its cabin : an infected person who shortly becomes a flesh hungry zombie. Then, its only a matter of time before the infection spreads to all the passengers. The plane crashes but our heroes manages to get out of the mess with only a few scars. After the war agains zombies, Belarus will basically thank the UN for saving the world... and strike them for their loss. They claimed the one of their special agent not only destroyed Welsh properties, but also crashed one of their aircraft worth millions. Belarus Airways' line of defense was based on the fact that no zombie were on board but passengers has suffered from an ordinary food poisoning. The Fugitive Investigative Strike Team, a special task force composed of United States Marshals, made-up a ploy to catch many criminals. For this, they set up a fake airline, Puño Airlines, a luxurious carrier flying from Miami to the Bahamas. The airport staff had of course no idea about the operation. 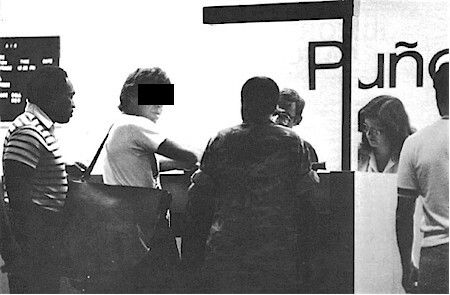 To attract the bad guys, american intelligence made them believe they had won an amazing package composed of a free flight, a weekend in a paradise island and even extra money for shopping. But what awaited them was nothing else than prison. In the end the US Marshals managed to arrest 3 816 fugitives ranging from drug criminals to Nazi fugitives. Promoted as the "Ultimate Star Wars Adventure! ", the Star Tours travel agency makes the visitors play space tourists on board a starship en route to the forest moon of Endor. From the waiting line, the set makes him believe he is in boarding area of space terminal. Then, the travelers are invited to enter in the StarSpeeder 3000 flight simulator. On screen, Rex, a droid who plays the role of a tour guide gives all the insctructions. After taking off, you are invited in a stunning journey outta space, avoiding meteorites, collide with comets and hyperspace jumps. We may have to wait a long time before flying off to faraway stars. But with Star Tours, you can at least, only for a few instants, catch a glimpse of insterstellar journeys. Oceanic Airlines 815 is the SYD-LAX flight that crashed during the pilot, on an island full of mysteries that fascinated the world during six years. President Obama himself had to postpone a speech for the show finale. Used in many scenes of the show, referred to many times by the characters, the airline has been an essential tool in the show's scenario. The production even built an official website with hidden trailers and secret clues. 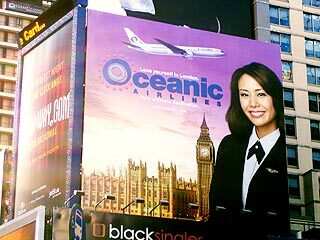 ABC went viral with Oceanic Air and turned the mysterious fictional airline into a “real” company with a “real” website – and produced billboards to promote it.